If I had to choose one movie as my favorite from the gore genere, it would have to be Koroshiya. It features the naive and misguided Ichi, and the fearless yet deranged Kakihara. Here in the states, the movie is called Ichi the Killer. Kakihara becomes obsessed with finding Ichi after he finds out how much pain he can inflict. 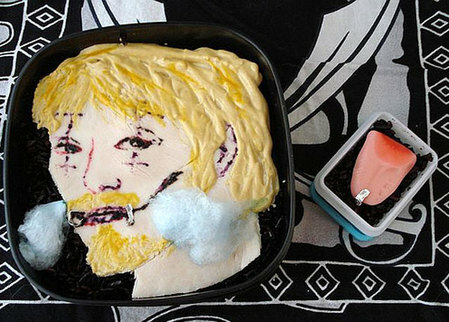 While browsing Zaeega, I found this cool bento of Kakihara from Koroshiya. The maker even included a small side dish that features a tongue. I won’t explain the significance of that just incase you are looking to watch the movie, but I must say it was a nice touch. Here’s the trailer below.